This weekend is the 3rd annual Reedy Reels Film Festival in Greenville, SC. It runs from Friday Nov. 3rd 7pm to Sunday Nov. 5th about 8pm. Films, events and awards will be the focus of the festival. You can purchase a session pass, day pass or event pass and see everything. During a session you will have a selection of films to watch. 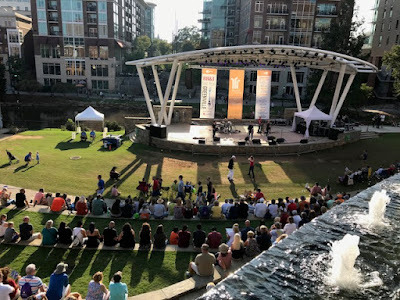 Peace Center Amphitheatre during one of the numerous free concerts that make downtown Greenville SC Great. The schedule of films and a short summary of each can be found at the festival website www.ReedyReels.com. The ticket prices are Session: $12, Day: $30, Festival: $50 (with T-Shirt). After the sessions you will be able to talk with directors, actors and other film professionals. For the movie aficionado this Greenville event is going to be thrilling. This type of event brings traffic from out of town into Greenville and continues to help downtown business and tourist industries. All of this increases the home values of Greenville SC Real Estate. Anything which increases the quality of life as well as bringing in income is a positive for Greenville home values. Plus it's just fun to go and do! Enjoy this weekend.